Incumbent Candidate: John Tippett, CFO, NFFFs Foundation’s Director of Fire Service Programs was past interim fire chief for the Charleston (SC) Fire Department. He is a 44-year veteran of the fire service. John began his career as a volunteer in Montgomery County, Maryland in 1974. He was hired as a career firefighter in Montgomery County in 1976 and spent the next 33 years with various departments and the County, retiring in 2009 as the safety battalion chief. He went to work in Charleston as deputy chief of operations in 2009 and was named interim fire chief in April 2017. John holds a Bachelor’s Degree in Fire Science and a Master’s Degree in Emergency Services Management. He has worked extensively on firefighter safety initiatives throughout his career, including introducing Crew Resource Management to the fire service and the Fire Fighter Near-Miss Reporting System. John frequently writes and lectures on topics of firefighter safety, decision making, leadership, and strategy and tactics. He earned his chief fire officer designation from the Center for Public Safety Excellence in 2012 and was recertified in 2015. John is also a Fellow with the Institution of Fire Engineers. 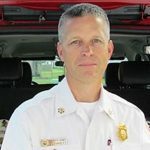 He currently serves as an at large board member of the International Association of Fire Chief’s Safety, Health and Survival Section, is a certified health and safety officer through the Fire Department Safety Officers’ Association, an instructor for the Blue Card Command Program, and a past president of the Charleston County Fire Chief’s Association. John was the International Society of Fire Service Instructors Instructor of the Year in 2006.